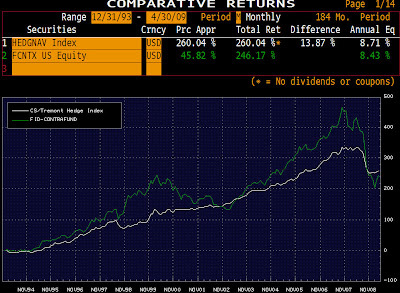 You can say what you will about hedge funds’ “disastrous” performance in 08, but hedge funds as a whole continue to outperform the S&P500 (from 1993 to present), both on an absolute return basis (with an 18% outperformance in 08) as well as on a risk adjusted basis. The chart below shows this comparison, with the hedge funds universe represented by the Credit Suisse/Tremont Hedge Fund Index. 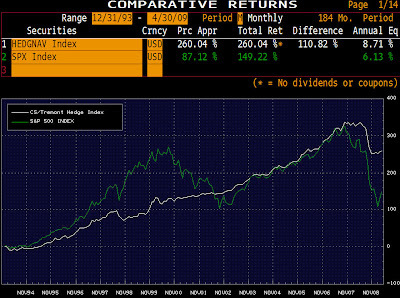 Another comparison worth analyzing are the returns for hedge funds vs. a strong actively managed equity mutual fund. Here is a look at the Fidelity Contrafund. Absolute returns for the two are extremely close (see second chart). Hedge funds however clearly did better on a risk adjusted basis. Presumably with the hedge fund “asset class” one gives up liquidity for a reduction in volatility. Warren Buffett’s 10-year bet on S&P500 (see story in Fortune) against Protégé’s fund index should probably include the ability to liquidate 100% of the funds at the end, as well as a comparison of risk adjusted returns (for example Sharpe ratios).